We saw in our Seminar Signup example in Part 1 that tickets and registration could both be used. In this article, we show two more examples. One shows when to use tickets, while the other shows when to use registration. Our final example shows tickets and registration used for different parts of the same event. Recall from Part 1, if personalization is low, then tickets is the best choice. If personalization of your attendee experience is low, use tickets. As the level of personalization increases, registration is the better approach. In this example, a festival is collecting entry payments and providing a ticket to each attendee to enter the event. Very little personalization applies in this example. The event offers different ticket types such as single-day Child/Adult/Senior tickets and multi-day passes. Attendees purchase tickets or passes in order to gain entry to the event. Once in the festival, there is no additional personalization for ticket- or pass-holders. Here’s how the table looks for attendees for this event. All four factors fall under Tickets making Tickets a much better choice than Registration (only covers three) for this situation. Tickets the clear winner here because group sign up is a major requirement for the festival, . There is a little personalization for the festival, however it is handled by using different tickets for different types of attendees. A multi-day pass provides a different experience for holders of those passes. However, the personalization is limited to the number of days pass-holders may enter the event. Events often have vendors, entertainment and volunteers. Each has a high degree of personalization in their experience at the event. All of these types of attendees are expected to signup individually, not as groups. Vendors will be manually approved and payment will occur on approval. Entertainers provide a range of information about their act and experience which organizers use to approve or decline each applicant. Volunteers are automatically approved for this event. They will have badges which indicate their attendee type. This helps the event organizers keep track of which parts of the event each may enter. Vendors have access to the vendor hall during set up and teardown. Entertainers have access to backstage areas. Volunteers have broader access than delegates or audience members at the event. When signing up, applicants provide a range of information to the event organizers as well as make selections. Vendors chose booth details and options. Entertainers provide stage details and information about their act. Volunteers provide information on experience, skills, job preferences and availability. They will each experience the event in very different ways. Each vendor’s booth is a personally selected combination of size, shape and structure. Entertainers each need a particular stage setup. Volunteers have their own job assignments. They all need different information about where they need to be, what they need to do and when they can come and go. Clearly registration is the best approach for all three participant types. Tickets does not enable the information exchange needed in order to provide the personalized experience needed by each of these event participants. Registration is strongly associated with conferences. However, we’ll show that conferences, and many other events, use registration and tickets for different parts of the same event. In this example, Conference Delegates will have personalized entry, they’ll be signed up for various parts of the conference program and the organizers will be collecting information from delegates for various purposes. Registration is the obvious choice for this type of attendee sign up. It’s a more personal experience. Organizers collect information from registrants. Registrants choose different event options such as training, seminars, demonstrations and so on. Organizers use the information to provide personalized and specific itineraries, based on delegate selections from the conference program. The high level of personalization makes it difficult for tickets to work well in this scenario. Registration is the best choice. In this event, a special dinner is also available to all delegates, regardless of how they registered for the conference. Delegates sign up as individuals and as groups. Not all delegates will attend the special dinner. There is a fee to attend. Attendees just need to show they have paid, and there’s no need for badges. The event will collect email, first name and last name to build an attendee list and there are no other special options to sign up for. Tickets is the best choice for the dinner. While personalization is high for conference registration, it is low for tickets for the special dinner. This is the best approach. The same delegates use registration for the main conference and tickets for the dinner sign up. Other “side events” like the special dinner can also have their own separate online signup. The table indicates whether tickets or registration is the best approach for each one. Why not just use one big registration form? Some might suggest “just add the dinner as an option on your registration form“. You could do this, but think about the experience of your delegate! Delegates often register months before the event, so many wont know if they’ll want to attend, or even be able to attend the dinner at the time they register. Providing a separate dinner sign up lets delegates make an informed decision when ready. They could sign up at the time of registering, or decide any time before to the cutoff date for sign up as specified by the organizer. By separating conference registration from the dinner sign up, the organizers avoid scenarios where delegates delay registering till they know if they’ll attend the dinner or any other side events. Tickets are ideal for side events since they provide a clean, flexible approach to handling entry to the side event. Which Events need Tickets and Registration? As you’re aware, many events have many different types of attendees and participants. Aside from the main sign up, there are often side events or activities that attendees and participants can sign up for. In each case, use the table to determine if tickets or registration is better. Most events need tickets and registration to cover all their needs. Personalization tells us if tickets or registration is better. So, let’s now make sure the ticket and registration system we use for our event is up to the job. How is Your Tickets and Registration System Performing? Take a sample run through your own system for tickets and registration as if you were signing up. It is important to find out if the experience of your attendees needs some improvement! 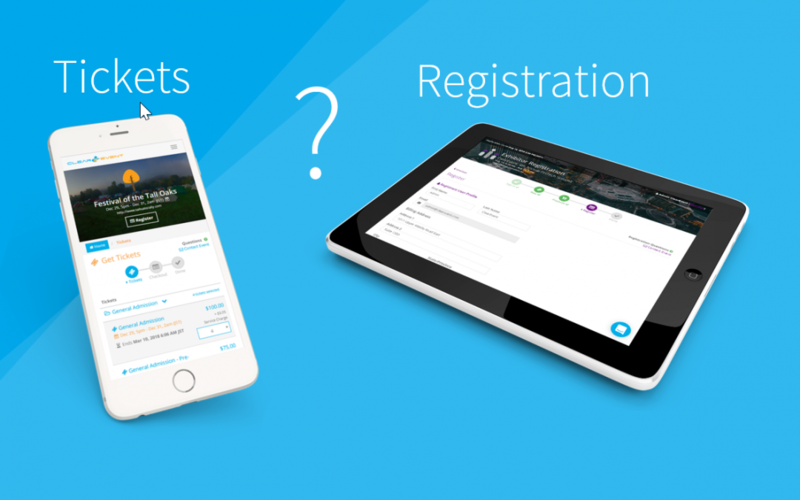 In the final part of this series, Registration and Tickets Part 3: Which System is Better? we’ll cover the key considerations for selecting a system for Tickets and Registration.